Navratri is a widely observed festival period in Hinduism, dedicated to Goddess Durga. Navratri is celebrated twice a year, once in the month of Chaitra (March-April) and once in the month of Ashvina ( September-October), where for 9 days devotees of the Goddess worship her in their own ways. Some perform holy rituals, some fast on the first and last days while there are even those who fast for nine days straight, surviving only on fruits and fast ‘allowed’ foods such as Buckwheat flour or Kuttu Ataa, Water Caltrop or Panifal Ataa, potatoes, milk, tea, rock salt, etc. They abstain from consuming fish, meat, onion, garlic, sea salt and other grains and lentils. Even before she was a teenager, my mother has been a devotee of Ma Durga and has diligently observed Navratri, twice a year. I have grown up seeing her perform rituals, visiting temples and cooking the Falahaar or Vrat ka Khana, – food to be consumed during fasts. 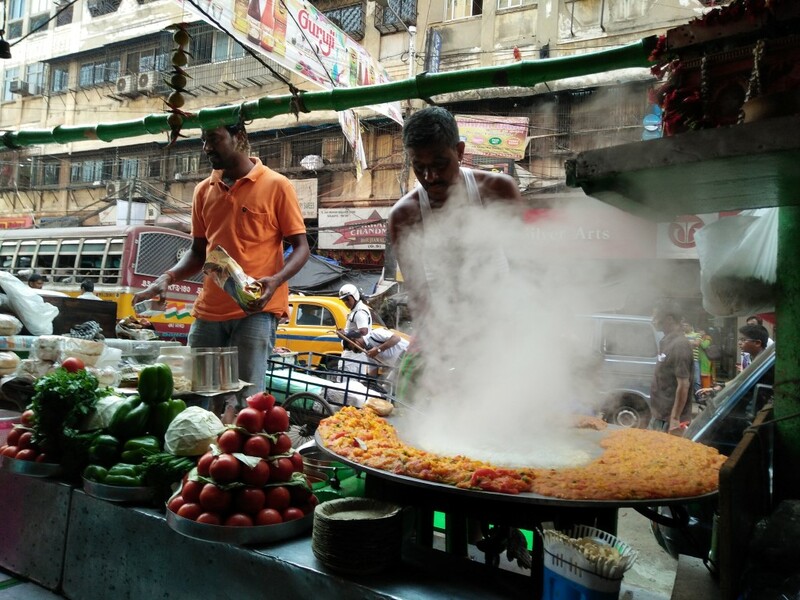 The food is innovative, delicious and a pleasant change from the daily meals that are normally eaten otherwise. 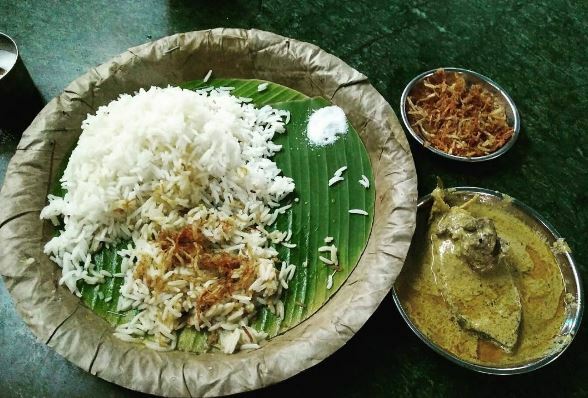 Although I cannot vouch for the food being very weight friendly because to be eaten during fasting, these preparations are usually very high in calories so that hunger is satisfied properly and the lack of nutrition is made up for. 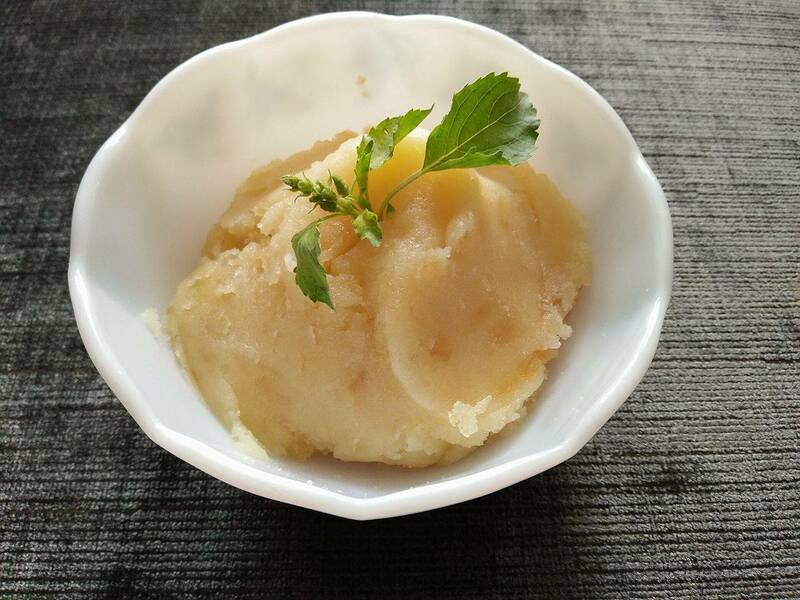 While the whole concept of fasting and the allowed foods is very debatable and every person has his/her own beliefs, in this post I am going to write about this particular sweet dish, a halwa made from mashed potatoes. The Indian Aloo ka Chokhhaa with rice and the continental mashed potatoes with steaks or burgers are both loved around the world. But a sweet variation of mashed potatoes is uncommon in my knowledge. My mother makes this during Navratri and I actually quite like it! 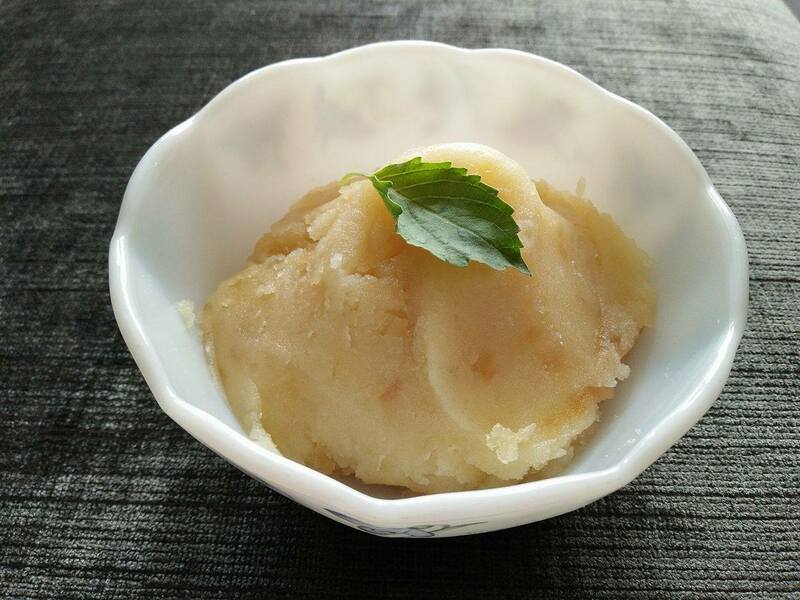 There a few ways to cook this halwa, but I am sharing one of the easiest recipes which I learnt from mom very recently. 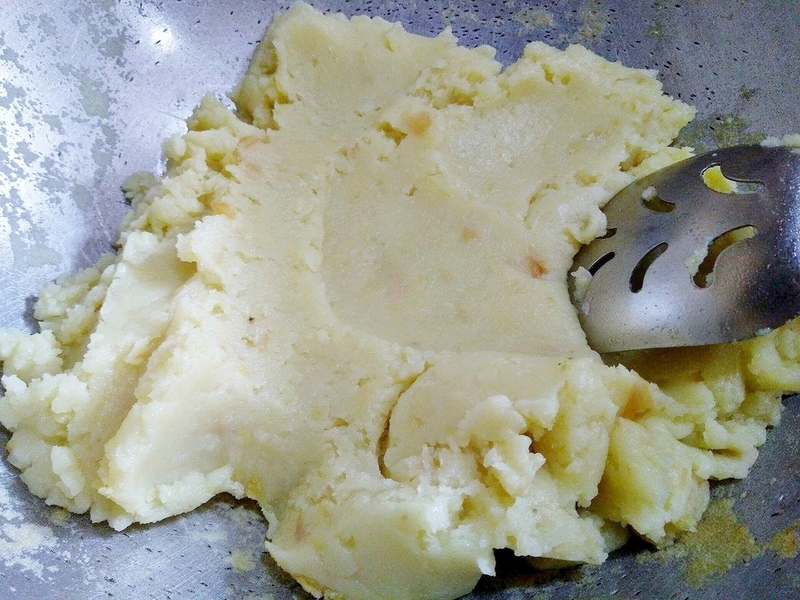 I make it using only three ingredients – potatoes, ghee and sugar. You can add some extra nuts and spices for added crunch and flavor. 2. 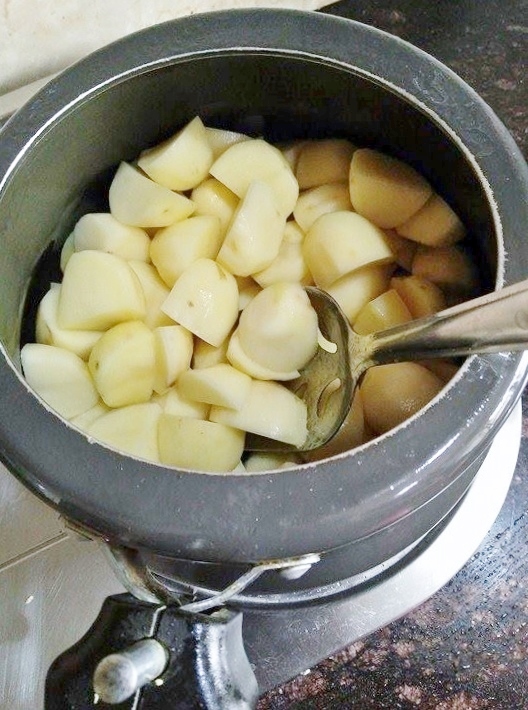 In a pressure cooker, heat half the ghee and throw in the potatoes. let sizzle for a minute. Put the lid on and let cook on medium flame. DO NOT ADD ANY EXTRA WATER. 3. Heat the rest of the Ghee in a deep bottom frying pan or wok. 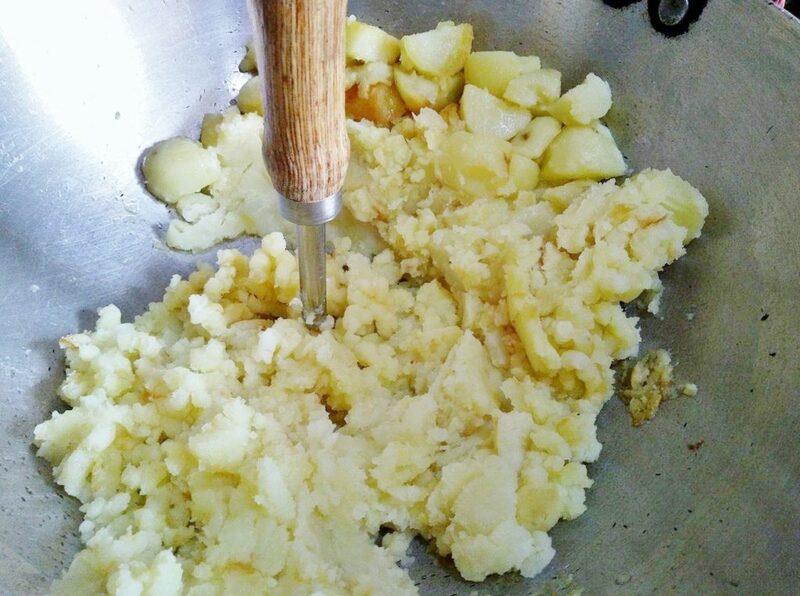 throw in the potatoes and mash with a masher or the back of your ladle in the wok itself on a medium flame. 4. 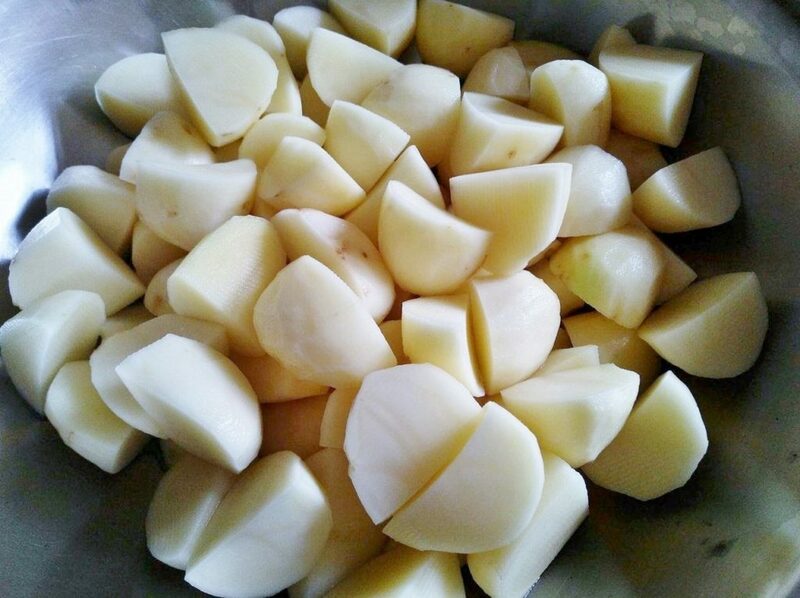 Once all the potatoes are mashed well, let the it cook on its own while you stir the mash once in a while. Be careful, and don’t let the mash burn or stick to the bottom too much. 5. After about 5-10 minutes of cooking, you will be able to see a glaze of ghee all over the mash and it will give out an aroma. That is when you add your sugar. 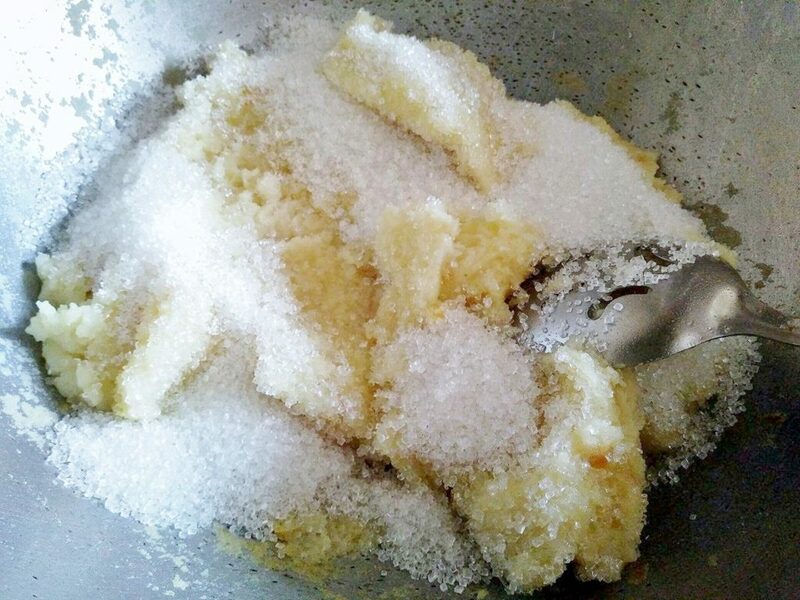 You can add regular sugar as it will melt soon enough so you dont really have to powder the sugar in a blender. Keep stirring and mixing the mash until the sugar has melted. You can let it sit on the heat for a couple of minutes more. The halwa is ready. You can have this as it is or you can add nuts and spice powders of your choice to give it more flavor. Its super easy and takes less than thirty minutes to make. If you try out the recipe, please leave a comment under this post with your feedback! 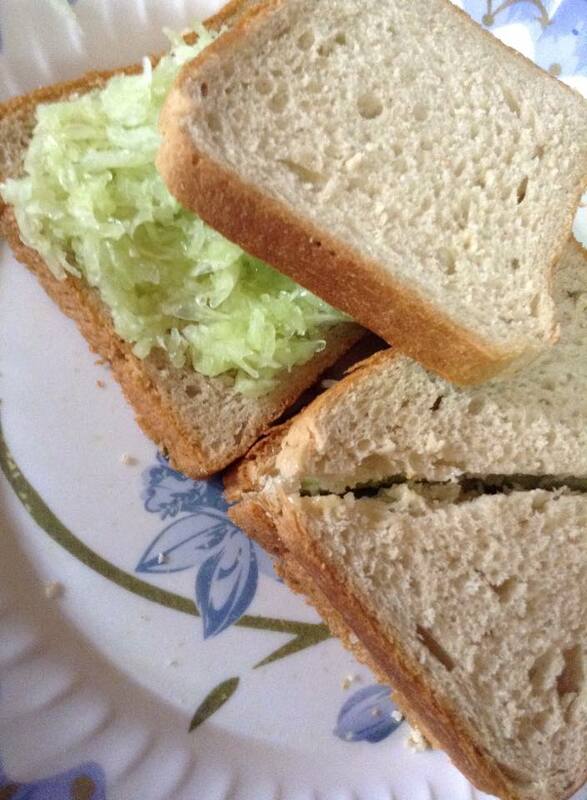 Recipe : Easy sandwiches you can make in minutes!